Spectacular south-facing waterfront within 1 hr of downtown Vancouver. Rare .93 acre property on the Sunshine Coast offers privacy (including 207ft ocean frontage & a private swimming beach),unsurpassed beauty, a gorgeous contrast from a high-tech, fast-paced urban lifestyle, and simple sophistication which soothes the harried soul. Casual elegant level access rancher with 2 bdrms/2 baths on main, fabulous great room with woodburning F/P for easy entertaining & breathtaking ocean views. 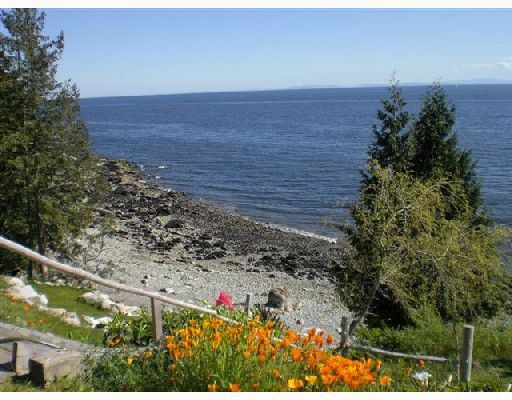 Extra space for family & friends incl bdrm/bathrm down-ideal for kids/cleaning up after swimming & beachcombing plus 600sf studio/sleeping cottage. Renew your spirits in this unhurried, natural setting. Relax on your deck, watch the cruise ships go by. What could be finer than falling asleep to the sound of waves crashing on the shore! Unsurpassed lifestyle & a significant legacy for generations to come. Zoning allows for 2nd full size home. Beautiful B.C. !